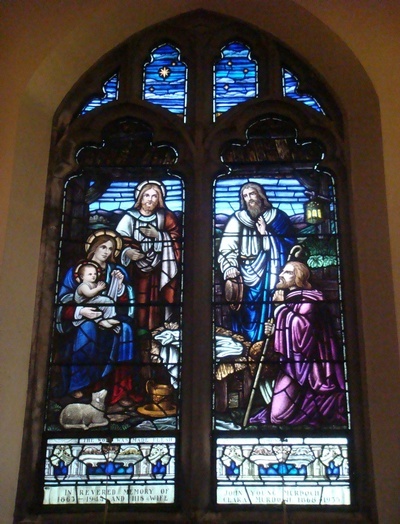 Did you know that church windows must be placed in a sanctuary in order of the events in the life of Christ? One cannot really control what a donor wants to depict in a window or when they choose to present it. So you have to leave some spaces and hope! Also, one of the reasons there is so much symbolism in church windows is that when they were first adorning churches and chapels, most of the congregation was illiterate. So they recognized a specific sair* or disciple from clothing or certain objects that were portrayed with him. 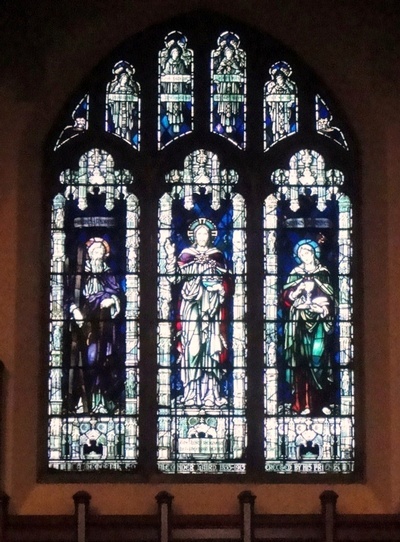 One good example of this is our chancel window, presented in 1916 by session and a committee in memory of Mr. Alexander Laird, which depicts Christ and his disciples. A Pair of Windows in the main entranceway, donated in 1916 in memory of the Turner Wilson family by the congregation. Turner Wilson was a casualty of the Great War. The windows depict the burning bush and the shield of St. Andrew, both Presbyterian symbols. 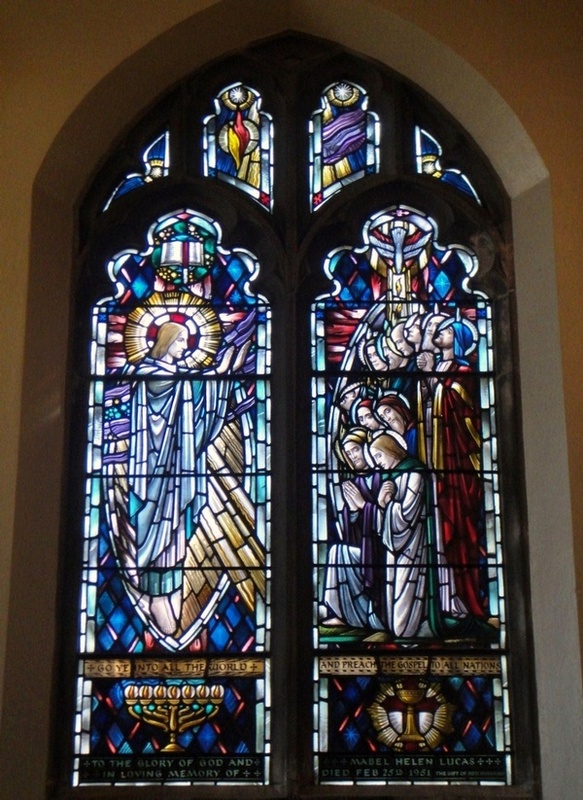 The main windows start chronologically at the southwest section of the sanctuary, beginning with the Nativity, donated in 1946 in memory of Mr. and Mrs. J.Y. Murdoch by their son. 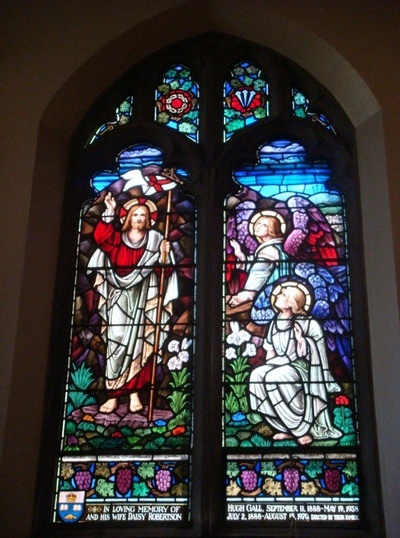 The next window portrays Jesus the Healer and was presented by Dr. and Mrs. W.J. Bell in 1954. Dr. Bell was a medical doctor and a member of the Senate at the University of Toronto. Next to this is a window donated in 1959 by Mr. R.W. McClain in memory of his mother Mrs. Catherine McClain, one of the founders of the Church Guild. 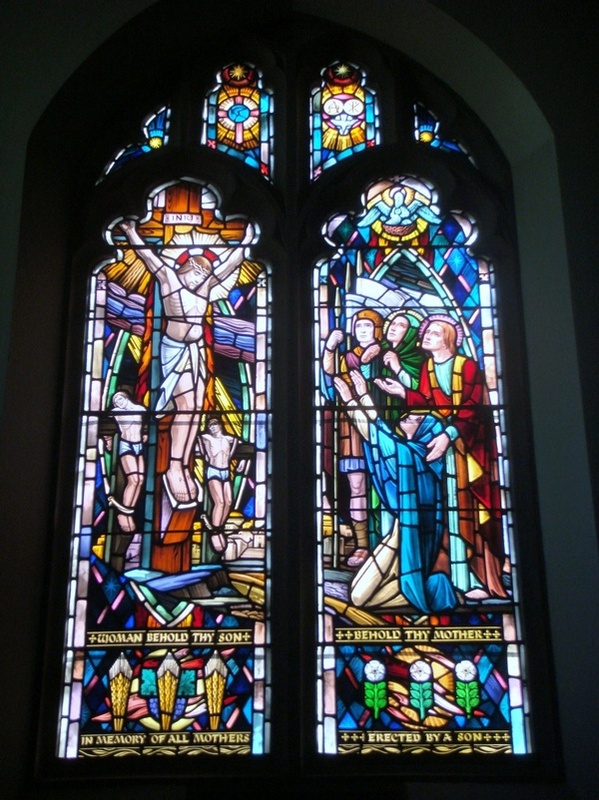 Crossing over to the east side of the sanctuary, we see the Crucifixion window presented in 1958 anonymously by a son as a memorial to mothers. After his death, it was appropriate to recognize that it was given by Mr. John Rogers. Moving forward we come to the window referred to earlier: The Resurrection. This was donated in 1945 by the wife of Hugh Gall, a renowned football player while at the U of T, who had an early death. The family added his wife's name on her death. The final window of the series is Jesus Commissioning the Disciples. 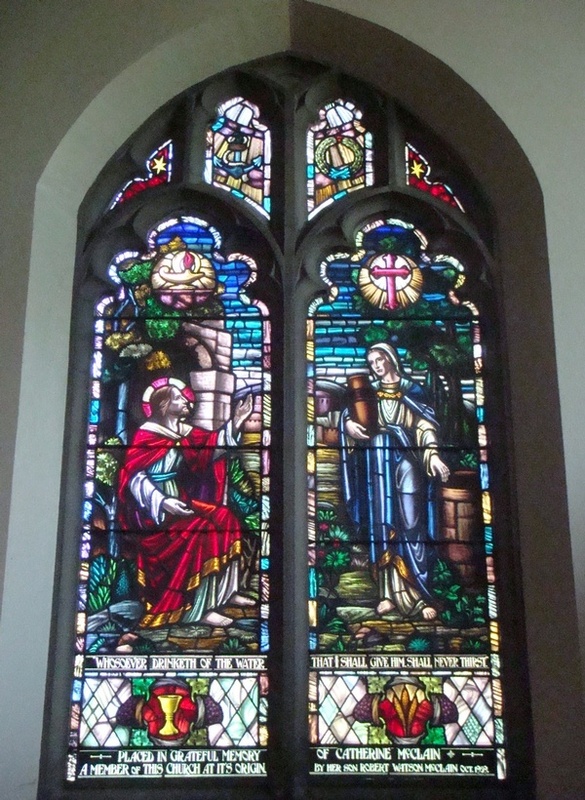 Mr. Frank Lucas, a former member of Session donated this window in 1954 in memory of his wife, Helen. In 1961 the choir presented Rosedale with several windows in honour of the former Director of Music, Clare Taylor. The window in the east wall of the chance] depicts musical instruments of biblical times. 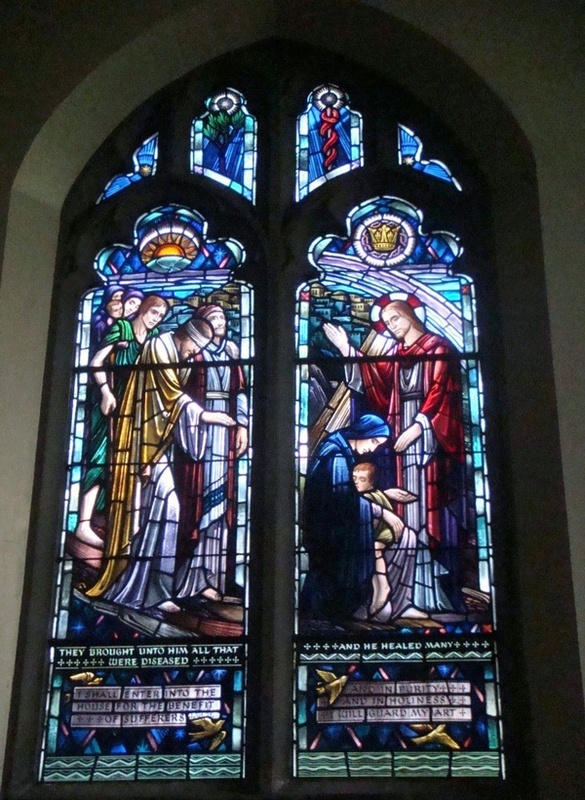 The four panels in the north wall of the transept depict prayer and the bible and the sacraments of baptism and communion.